As much as I appreciate, listen to and often review the extreme sides of metal, from bestial black to ambient acoustic, the soul often craves for straightforward heavy metal. For something from which my love of metal began 30 years ago. Primal Fear would be destined to deliver that fix, I knew it, even though I have not been a frequent visitor to the Germans' art since, well, Jaws of Death. 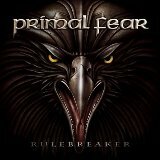 So my perspective below on Rulebreaker is not necessarily based on Primal Fear evolution over all these years, but instead relying on a momentary snapshot, hopeful for simple satisfaction. And, man, did I get what I needed and more from Rulebreaker ... Burly, manly, not necessarily complicated in terms of songwriting, but full of piss and vinegar attitude, the album is what the doctor ordered for the lovers of classic metal. Angels of Mercy and The End is Near set the tone right away, delivering powerful riffs in a deliberate manner. Sure, it is a power chord sequence there on The End is Near, but if it penetrates and makes you headbang galore who the hell cares. The songs on Rulebreaker are mostly short bursts and at times hint at old Accept with a much improved production (title cut), and, I swear, the first three notes of Bullets & Tears are a tribute to iconic Breaking the Law. Everything on the album just reinforces the fact that Primal Fear are old grizzly veterans who know exactly what they are doing, how to write their hooks and melodies and which production knobs to twist. And while the riffs, powerful drums and booming bass create the impression of a rough biker veneer, the melodies hint that there is a cuddlier bear inside. Yet, as soon as there is a softer spot revealed, anthemic statement songs like In Metal We Trust or slower piledriver harmonies of The Devil in Me leave no doubt about metal potency of this well aged crew. Then there are "different" moments when you least expect them. Just when you think everything will be at machine gun double bass pace on the album, We Walk Without Fear unfolds into a verifiable bonafide epic. Yet epic on Primal Fear circa 2016 does not mean lacking balls, it is just the melodies are soaring even further and apocalyptic middle is overcome by a winning solo, the song showcasing personal struggles in the modern world. Even softer track, like The Sky is Burning, here is not some sappy balladeering and continues to display the attitude featured throughout the album. Album's solos are never overextended or self-serving and in some spots are truly orgasmic (The End is Near). Any discussion of a Primal Fear album is going to be incomplete without mention of Ralf Scheepers form. Well, his form is fine. The power in the mid-to-low register and the ability to reach high notes (The End is Near, Constant Heart, blistering Raving Mad) provide more evidential grounds why the man was considered to be Rob Halford's successor in Judas Priest. An excellent quality classic heavy metal album is what you have in Rulebreaker, nothing more, nothing less. Despite what the title says, Primal Fear stayed close to the tenets, but the impact is obvious. To be enjoyed exactly for what it was advertised.